It’s been a few days since last I posted. I just wanted to reflect briefly on the differences between studying at Oxford and Columbia University (my home institution). Oxford is academically intense in ways different from Columbia, or most American schools for that matter. At Columbia, I had a busy schedule of classes, lectures, and assignments – several hours of class a day followed by mandatory extracurricular meetings and events. I was genuinely busy at Columbia and at many times stressed. At Oxford, my schedule is quite different. I am busy here, not by obligation but by choice. With two tutorials per term – the first meets weekly and the second fortnightly – I spend only 12 hours per term in class. This means that, over the course of one academic year, I will have spent a total of only ~45 hours in required classes. The rest of the day and year are for me to fill in the manner I see most fit. It is possible to fill this time with watching television, traveling Europe, or partying – all of which are quite easy at a diverse and cosmopolitan city like Oxford. It is also possible (and likely more justifiable) to fill this free time with self-directed studies, completing one’s reading, visiting art museums and cultural venues, or attending lectures in related disciplines. Factoring in all the non-mandatory lectures I attend and optional events, I probably spend more time in class at Oxford than at Columbia. This is entirely by choice for only now am I able to craft my daily schedule as I see most fit. The reading room of Duke Humfrey’s Room at the Bodleian Library. The printed books behind my computer are from the 1500s. Reading and writing are probably the most enjoyable aspects of filling my free time and daily schedule. Entering Duke Humfrey’s Library or sitting beneath the Radcliffe Camera, I feel ennobled as if this were truly the only and best place to crack open a book and peruse its pages. Some dark dorm room, some bland low-ceilinged reading room, or anyplace else would somehow diminish the value of a great book – one cannot read a great or enjoyable book in an environment that is unbecoming of the book’s value and beauty. All books in the Bodleian Library system have their covers stamped with the symbol above. The nearly 30-some college chapels are also wonderful places to read and study. There is a certain somber silence therein, with the smell of burnt candles, wood polish, and incense. All places have distinct smells, and associated with each smell is the aura (positive or negative) of a place. The ceiling of the chapel stretches up into the darkness if it is night out. And, if it is still day, knife-shafts of light penetrate the chapel interior. The chapels of the more popular colleges are rarely quiet, as the streams of tourists interrupt the somber study of great texts. The chapel of the less-famous colleges are equally beautiful but quiet places more appropriate for silent study. As nobody is around, I can sit in the choir stalls with oak paneling all around and a red cushion beneath. As nobody can disturb me, occasionally I stand up and walk around the chapel in the perfect silence of intellectual contemplation. The sounds of the outside voices and street may penetrate the chapel interior, but those sounds feel a distant world away. In retrospect, I do not feel I took full advantage of my Columbia University experience. I likely spent too much time socializing or attempting to build genuine relationships with my peers at Columbia. And I likely spent time on Facebook that I could have spent reading and learning in pursuit of greater intellectual joys. In retrospect, I realize that I shared more in common maturity-wise with people older than me than with people my age. The conversations with Columbia faculty over office hours were, in comparison to conversations with peers, rich and engaging dialogues. The Oxford tutorial is, ideally, a platonic dialogue between teacher and student – the kind of intellectual relationship I sought to have with my peers at Columbia and yet often failed to find. 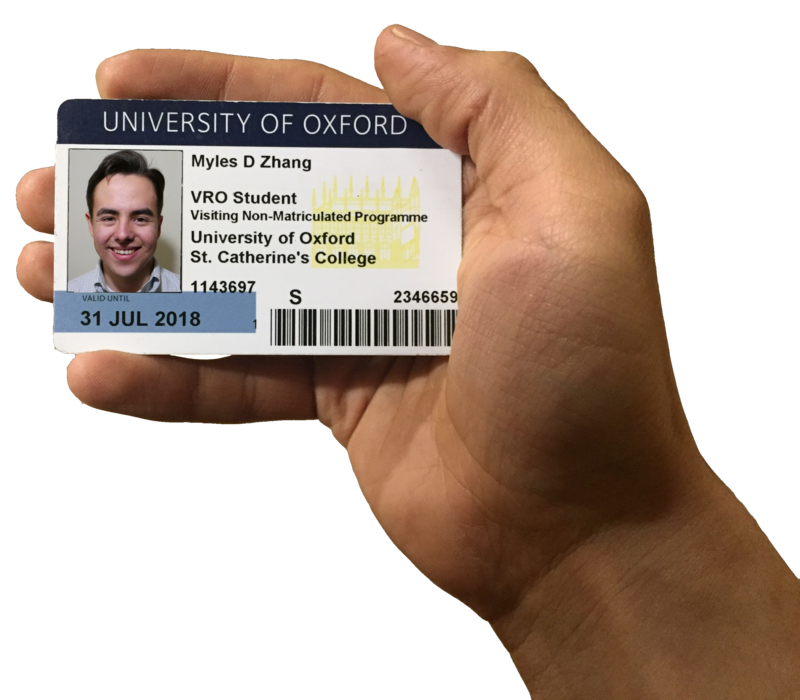 I enjoy being and studying here at Oxford because there is nothing else in the world I could imagine myself doing than working and studying here – not studying for some future benefit but studying for its own sake and for the intrinsic enjoyment reading brings. Life is short, and the time here at Oxford shorter still – and it is unlikely I will ever have the good fortune of one day returning to this place. Carpe diem! A view of my bookshelf here at Oxford. Most of the books here are for class, except for the book titled The Black Death, which I am reading for pleasure. The Oxford tutorial is, ideally, an ongoing dialogue between teacher and pupil. The face-to-face interaction, or the pairing of a single student with a single teacher, is essential for nurturing this personalized, intellectual dialogue. For an hour a week, or more, a student will discuss the weekly readings with their professor, who might listen and lecture to the student, initiate a platonic dialogue, or simply correct errors the student may have made in his analysis of the week’s readings. The tutorial can vary significantly in format, depending on either the subject of one’s studies or one’s degree of familiarity with the subject. For humanities, the teacher will assign a weekly essay of 1,500 words or more. For sciences, problem sets may be due. The tutorial is an opportunity to review this information, to seek points of clarification, and to develop one’s essay or problem set in preparation for next week’s assignment. It is easy to cheat. As one’s work is ungraded and the tutorial is so personalized, one is not under any obligation to do the week’s readings. The teacher, too, can choose not to give the student the full benefit of her time and energy, or choose to meet the student unprepared to discuss the week’s readings. However, the tutorial to function requires the equal commitment of student and teacher to the learning process; if either party withdraws their half of the contract, this learning endeavor will flounder. I am taking two tutorials this Michaelmas term. (There are three terms of eight weeks each here at Oxford – Michaelmas in autumn, Hilary in winter, and Trinity in spring.) My primary tutorial is on Medieval Cathedrals, taught by an art historian specializing in medieval art of Italy. My secondary tutorial is Economics of Feudal Europe, taught by a historian on the medieval era and its economic system. I am taught individually in both courses – and weekly essays are assigned of 1,000 to 3,000 words. Cathedrals­ consists of readings of primary source documents about the Middle Ages and its cathedrals (see Gervase of Canterbury), complemented by contemporary scholarship about these cathedrals. Economics consists of various readings assessing the social structure and systems of power within feudal society, complemented by selected and translated primary source documents of land transactions, work contracts, or land grants. Clearly, the emphasis is on reading, reading, reading – there is but little else to do here at Oxford. Time spent in class or with a teacher is minimal – limited to less than two hours a week in my case. Time spent in the library or with a book is maximal – sometimes up to a hundred pages of reading per day. It is not possible to succeed in the tutorial if one does not read, and certainly not if one is not passionate about the subject. The tutorial prizes diligent work, close reading, careful analysis, and the motivation required to complete all this in time for the next meeting. As with any life experience or class, one only gets as much out as one invests in.